The annual candle-lit procession of Las Posadas travels around the Santa Fe Plaza and concludes in the Palace Courtyard. 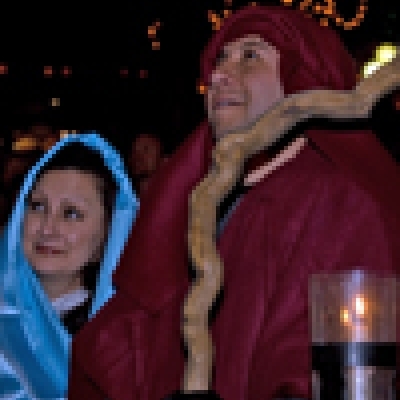 This version of an old Hispanic tradition, celebrated around the world, recreates Mary and Joseph’s search for a place to give birth to the Baby Jesus—and includes innkeepers who deny the Holy Family a place of rest. You are invited to stay for carols, cookies and hot cider in the Palace Courtyard. Free. The History Museum and Palace will close at 3 p.m. to prepare for this event.